Ben Grande and Billy Snyder showing off the winning sack. 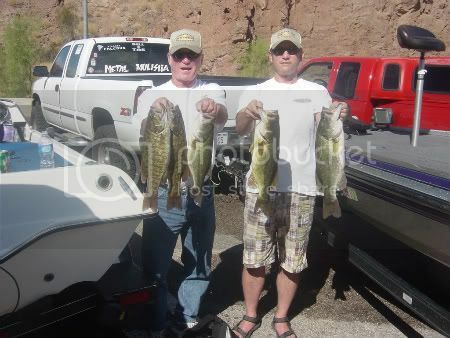 Bass Anglers Federation held our April tournament at Lake Mead, launching out of Echo Bay Marina. Eight boats showed up to enjoy the perfect weather and the hungry Smallmouth Bass around Echo Bay. After Don Hill launched the field everyone headed out to enjoy a great day of fishing. As the day unfolded some anglers had there problems with a disappointed Matt Warner losing his starter and 1 trolling motor battery. Matt and his partner Mike Grande had over 13lbs of bass but never made the weigh in. Other anglers with problem included Gary Freeman and Paul Hemsley. Gary running out of fuel and Paul losing the top end of his Optimax. At the weigh in anglers talked of catching lots of fish and having a great time. In the end Don Hill and Randell Bruce finnish the day in Third place with a 10.99lbs limit of Smallmouth. Second place for the second tournament in a row was Brent Becker. Brent and his partner Matt Hoffert weighed in 14.87lbs with a second place big fish of 4.74lbs. The Team of Ben Grande and Billy Snyder took the win with 15.99lbs with a Winning Big Fish a 4.98lb Largemouth bass. The April tournament was a big success with a lot of nice fish caught. Congratulations to Ben and Billy for sweeping both the tournament and big fish honors. 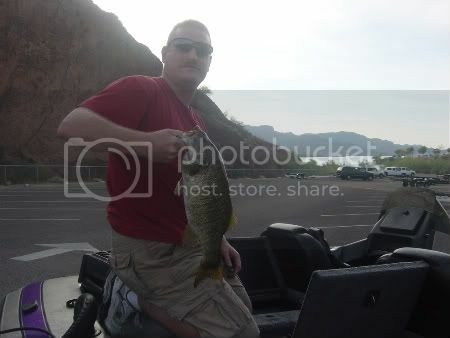 Matt Hoffert showing a nice bass. Paul Hemsley and Bob Keck showing 12.63lbs of bass. 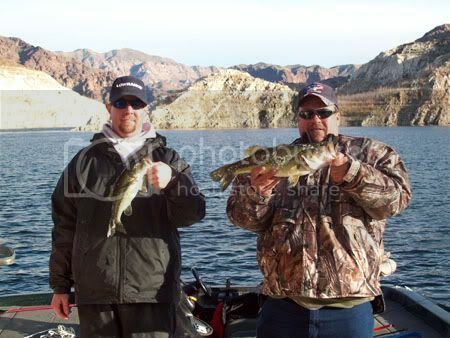 Bass Anglers Federation held the trird round of the 2011 season at Temple Bar, Lake Mead. 10 teams meet to enjoy to great weather and some great fishing. Richard and Rick Powers launched all the teams at 5:30am and the teams scattered around Temple Bar. The morning was clear and clam with some clouds and light wind in the afternoon. All the teams made it back to the marina safe to see how they stacked up. The team of Alan Zamora and Tom Martin weighed in 5 fish at 11.26lbs with a kicker fish of 3.86lbs landing them in third place. 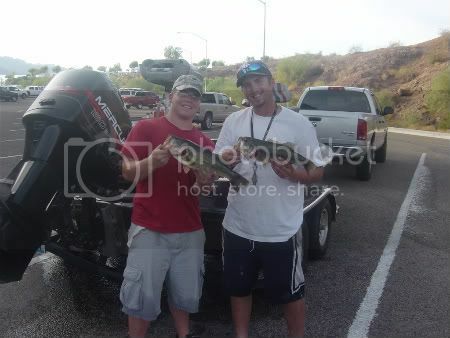 Brent Becker and Jon Whisenant came to the scales with 5 fish weighing 11.74lbs with the winning big fish of 4.14lbs. Taking the win was the team of Paul Hemsley and Bob Keck with a weight of 12.67lbs and 3.34lb big bass. Congratulations to Paul and Bob for winning the March tournament. 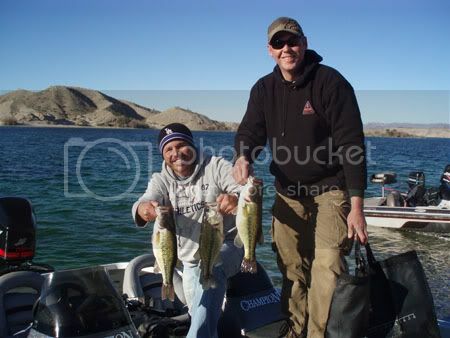 Brent Becker and Jon Whisenant with some nice bass. 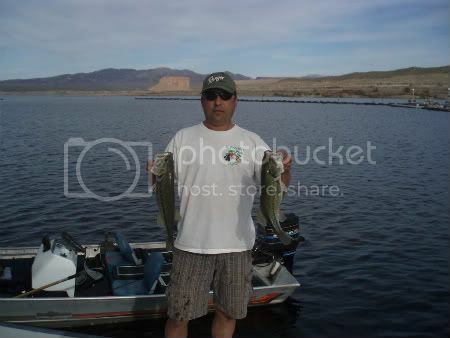 Alan Zamora showing his 2 best fish. Chris Landermin and Duaine Cowley show off three of their 5 bass. 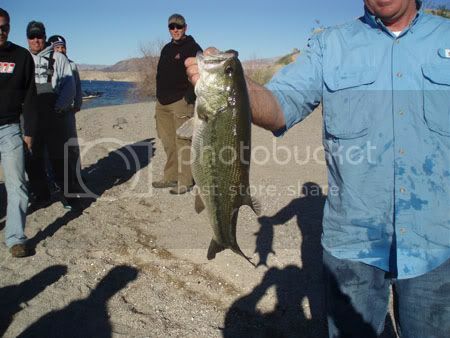 Bass Anglers Federation held the February tournament at Cottonwood Cove, Lake Mohave. 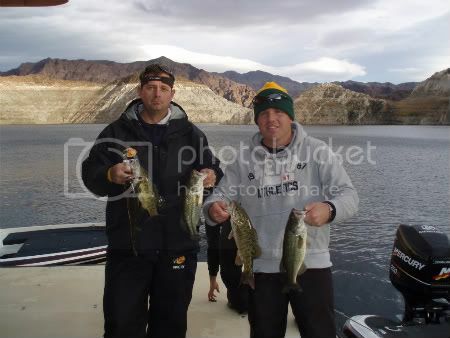 9 teams made the 1hr 20min trip to enjoy the warmer weather an some tough Lake Mohave fishing. Early mourning started with calm wind and became light by the afternoon with temps in the high 60s. Alan Zamora acted as the call boat and launched the teams at 6:15am. All the teams made it safe though the day and returned to weigh in and see who had the best day. Coming in third place with 2 fish 9.02lbs including the winning big fish a 6.24lb largemouth was Greg Cyphers and Randell Bruce. Coming in second with 5 fish including a 4.59lb big fish was Paul Hemsley and Joe Raftery weighing in 14.54lbs. Taking the win by only .04lb was the team of Chris Landermin and Duaine Cowley. Chris and Duaine brought 5 bass weighing 14.58lbs including a 4.39lb big fish. Congratulations to Chris and Duaine on taking an extremely close victory. Paul Hemsley and Joe Raftery showing their five bass. 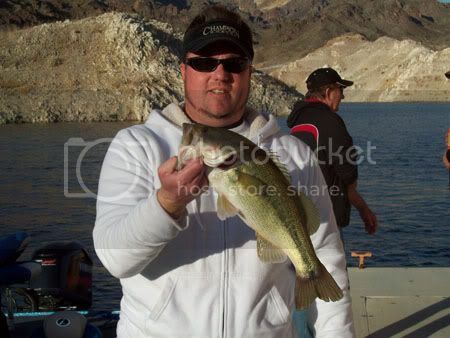 Greg Cyphers bought this 6.24lb bass to win the big fish pot. The rest of the field finished as follows. 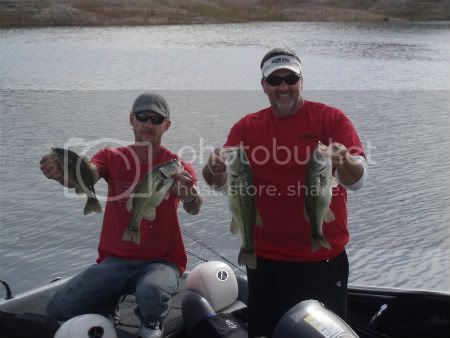 Congratulations to Deejay and Joe Raftery for taking the first win of the 2011 season with 12.77lbs. 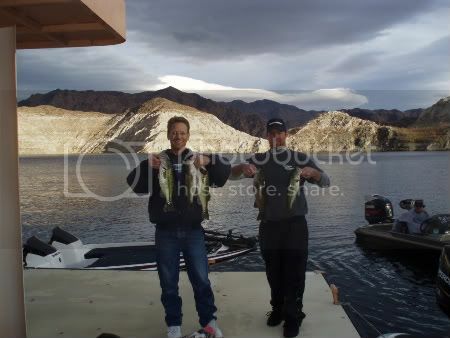 Bass Anglers Federation held the first tournament of 2011 on Lake Mead launching from Callville Bay Marina. Eleven teams met early Saturday morning to enjoy the near perfect weather. Don Hill acted as call boat launching everyone at 6:05 am. 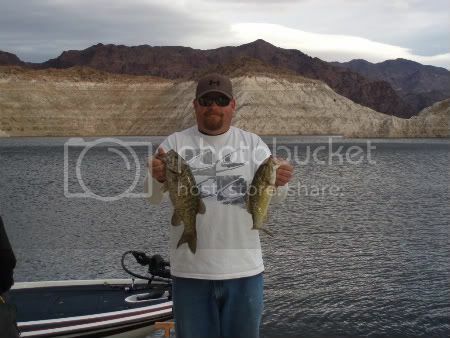 Some anglers headed for the Narrows with most choosing to stay in the Callville area. Fishing proved to be tough as only two of the eleven teams managed a limit. Kieth Van Riel and Randell Bruce brought 4 bass to the scales weighing 7.70lbs to take home third place. Second place went to a very consistent Greg Cyphers and Curtiss Easter weighing 5 bass at 9lbs even. Taking the win for the first time in 2011 was Deejay Evans and Joe Raftery . Deejay and Joe weighed in 5 bass at 12.77lbs including the winning big bass of 4.67lbs reeled in by Joe. Other notable bass weighed in were a 4.26lb largemouth by Billy Snyder and a 4.11lb largemouth by Alan Zamora. Greg Cyphers and Curtiss Easter showing us their 5 bass. Joe Raftery with his 4.67lb lunker. 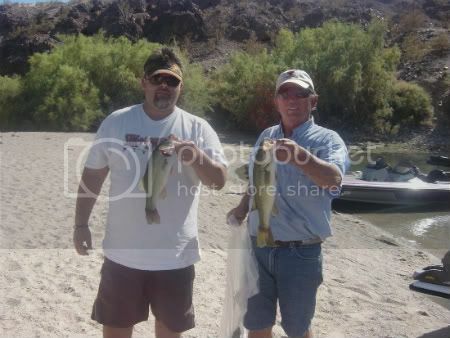 Richard Powers and Billy Snyder with their catch including a 4.26lb toad. 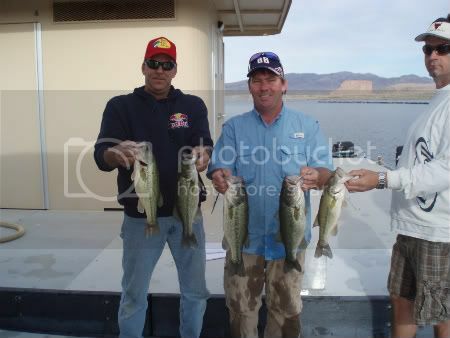 Bass Anglers Federation launched the last tournament of this year from Callville Bay Marina on December 18, 2010. 9 teams gathered at the top of the ramp and were met with 20mph wind and a high chance of rain. The wind blew out of the south all day but the rain held off until the ride home. Some anglers stayed to fight rough water in Callville Bay while the rest headed for the Narrows hoping to escape the wind. The fishing was good as most teams weighed some nice fish. However, it was a tough day for some with Joe Raftery losing the lower end of his motor in the narrows forcing him to be towed by the Rangers. Also Don Hill's motor stopped after pounding big rollers outside Callville Bay also needing to be towed. Last Chris Landermin soaked his motor causing running problems for the entire day but still managed to make the wiegh in. At the end everyone made it back to the marina safe. Chris Landermin and Tom Martin take home third place. Curtiss Easter showing the winning Big Fish. At the weigh in it was Chris Landermin and Tom Martin limping their boat to a third place finnish with 5 fish @ 9.18lbs. Second place and Big Fish winners were Paul Hemsley and Curtiss Easter weighing in 10.38lbs with a 3.82lb small mouth. First place went to Kieth VanReil and Richard Powers with a bag of 10.96lbs with a 3.13lb large mouth big fish. 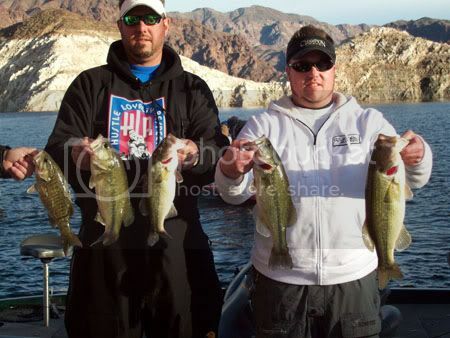 Congratulations to Kieth and Richard for the impressive win on a rough and windy Lake Mead. 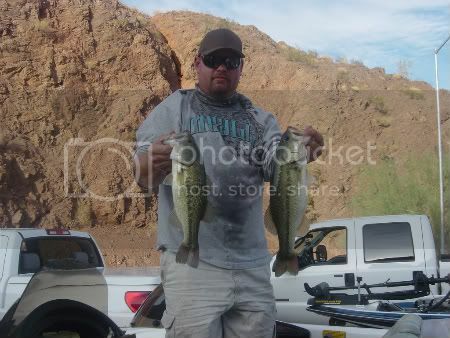 Bass Anglers Federation held our club championship at Lake Havasu on October 23-24. After one day of fishing it was Andrew McClure and his brother holding on to a slim lead. At the end of the second day it looked like Andrew and his brother may take the win weighing in another solid bag. In the end it was Shane Salsbury and his father taking the win with a giant weight on day two. Congratulations to Shane and his father for winning the Club Championship. Curtiss Easter with two solid keepers. 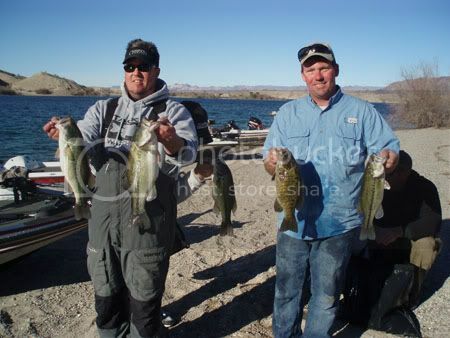 This months Tournament was held at Cottonwood Cove Lake Mohave. The weather was outstanding with only a small breeze all day. 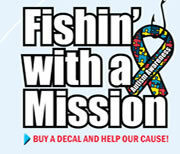 All the anglers showed up on time and ready to go. Brent Becker launched the boats at 5:55am with most boats staying around the narrows. Don Hill took advantage of the calm conditions as did Deejay Evans, Don going north and Deejay heading far south. After a beautiful day of fishing everyone met at the tires to see who won. 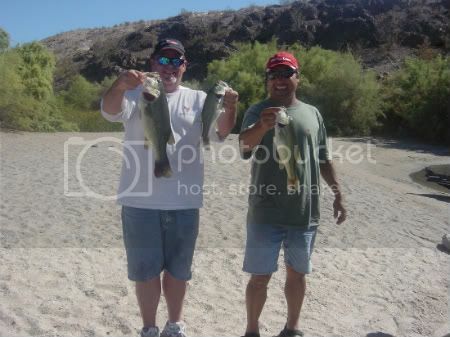 Third place went to Don Hill and Alan Zamora with 4 fish weighing 8.26lbs an the winning big fish of 4.97lbs. Second place money went to Greg Cyphers and Tony Velasco weighing in a limit of 8.46lbs. Taking first place money was Deejay Evens fishing with his son Dylan. Deejay and Dylan weighed in 5 fish @ 10.46lbs. 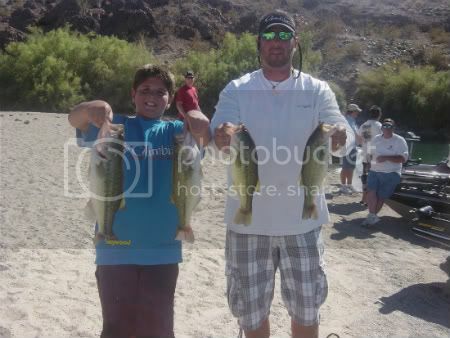 Congratulations to Deejay and Dylan Evans for the win on Lake Mohave and Don Hill for big fish honors. Don Hill and Alan Zamora showing the winning big fish. This was also the last tournament of the season brining us to the end of a great season. After the points were tallied up Brent Becker won the Boater Angler of the Year. For the second year in a row Tony Velasco walked away with the Non-boater Angler of the Year award. Congratulations to both anglers for their great seasons.